A member of the ski patrol at Whistler Mountain, British Columbia in Canada. 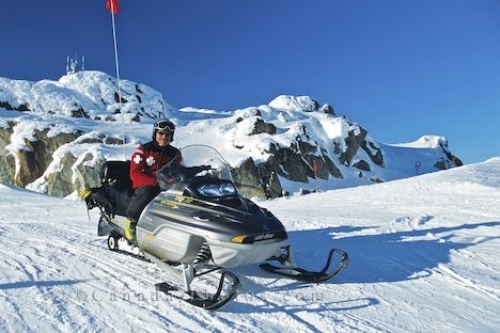 A member of the ski patrol on duty at Whistler Mountain in British Columbia, Canada. These men and women must be excellent skiers and have a significant degree of first-aid medical training to deal with hundreds of minor and major emergencies that occur on the slopes every year. Picture of a member of the ski patrol cruising the slopes at Whistler Mountain in British Columbia, Canada.